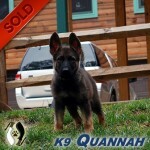 Meet Quannah will be more than suitable for front line patrol in a major urban department. Quannah will not be available for SAR. If you have an interest please drop us a line. All of our Police K9’s sell almost immediately.